Is Jupiter Earth’s Guardian or Ultimate Destroyer? On 1994 July 16-22, over twenty fragments of comet Shoemaker-Levy 9 (image below) collided with the planet Jupiter. The comet, discovered the previous year by astronomers Carolyn and Eugene Shoemaker and David Levy, was observed by astronomers at hundreds of observatories around the world as it crashed into Jupiter's southern hemisphere. In July or 2010, a comet or asteroid ripped another Pacific-Ocean sized hole in Jupiter. Is Jupiter a giant protective magnet for Earth, or are these events wake-up calls? Since 1941 many astronomers have thought of Jupiter as a protective big brother for planet Earth -a celestial shield, deflecting asteroids and comets away from the inner Solar System. This long-standing belief that Jupiter acts as a celestial shield, deflecting asteroids and comets away from the inner Solar System, has been challenged by the first in a series of studies evaluating the impact risk to the Earth posed by different groups of object. Dr Jonathan Horner of Great Britain's Open University has studied the impact hazard posed to Earth by the Centaurs, the parent population of the Jupiter Family of comets. His research showed that the presence of a Jupiter-like planet in the Solar System does not necessarily lead to a lower impact rate at the Earth. 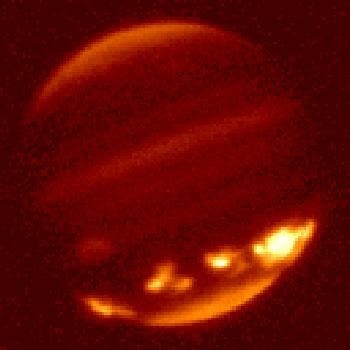 Horner said that Jupiter's role as guardian may have been overstated: "It seems that the idea isn't so clear-cut." The idea of Jupiter as protector was first proposed by planetary scientist George Wetherill in 19941. 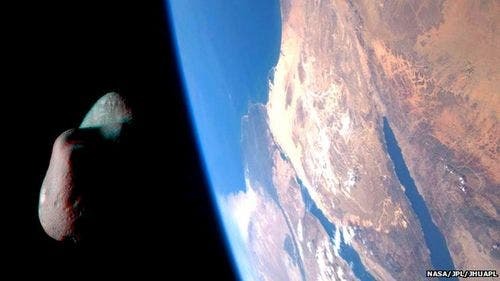 Wetherill showed that the planet's enormous mass — more than 300 times that of the Earth — is enough to catapult comets that might hit Earth, like a slingshot ,out of the Solar System. Other astronomers have postulated that Jupiter's gravitational pull would thin the crowd of dangerous asteroids and other objects, making Earth less impact prone. Other research has suggested that, in the past, changes in Jupiter's orbit might have actually increased the number of objects on a collision course with earth. Until recently, Horner says, little work was done to test either idea. The short period Jupiter Family of Comets (JFCs) are believed to originate from the Kuiper Belt and have orbital periods of up to 20 years and low inclination controlled by Jupiter. The Kuiper Belt is a large reservoir of small icy bodies just beyond Neptune. From collisions or gravitational perturbations some Kuiper Belt objects escape and fall towards the Sun. When they approach the Sun their volatile elements will start to sublimate off the surface and we will see the object as a comet. Because the orbit crosses that of Jupiter, the comet will have gravitational interactions with this massive gas giant. The objects orbit will gradually change from these interactions and eventually the object will either be thrown out of the Solar System or collide with a planet or the Sun. The second class of comets, the long periods, are believed to originate from the Oort cloud. This is a vast spherical reservoir believed to exist at the edge of the Solar System. The long period comets have periods of less than 200 years and no preference in orbital inclination. "The idea that a Jupiter-like planet plays an important role in lessening the impact risk on potentially habitable planets is a common belief but there has only really been one study done on this in the past, which looked at the hazard due to the Long Period Comets," Horner continued." We are carrying out an ongoing series of studies of the impact risks in planetary systems, starting off by looking at our own Solar System, since we know the most about it." Horner and colleague Barrie Jones built several versions of the Solar System on the Open University's computers: one with a Jupiter, one without, and several with a gas giant that was either a quarter, half, or three-quarters of Jupiter's mass. The system also contained 100,000 centaurs — large, icy bodies from the Solar System's Kuiper belt, within which Pluto lies. After running their models for 10 million virtual years, Horner and Jones found some striking results:The Earth was about 30% more likely to be hit by a centaur in a Solar System with a life-size Jupiter than it was in a Jupiter-less system. "We've found that if a planet about the mass of Saturn or a bit larger occupied Jupiter's place," Horner concluded, "then the number of impacts on Earth would increase. However if nothing was there at all, there wouldn't be any difference from our current impact rate. Rather than it being a clear cut case that Jupiter acts as a shield, it seems that Jupiter almost gives with one hand and takes away with the other!" The weakness of Horner's tentative conclusion is that it fails to take into account Jupiter's ability to deflect Earth-colliding objects from the Oort cloud, a massive cloud of comets that surrounds the Solar System. The Open University team is assessing the impact risk posed to the Earth by the asteroids and will go on to study the long period comets, before examining the role of the position of Jupiter within our system. But back to Stephen Hawking: How many times in our galaxy alone has life finally evolved to the equivalent of our planets and animals on some far distant planet, he asks, only to be utterly destroyed by an impact? Galactic history suggests it might be a common occurrence. Our cold comfort comes from the adjective "galactic" -that's a hugely different time perspective that our biblical three score and ten. Check out Hot Tech News from IDG News –Publishers of PC World, MacWorld, Computerworld–above right.